You’ve heard of downward dog, but what about downward cat? Or even downward goat? All around San Diego County, fitness has gone four-legged, thanks to yoga classes that combine exercise with a love of animals. From goats to cats to dogs, here are three ways to connect with the animal kingdom while tapping into your inner yogi. Baby goats are all the rage. Just one look at your social media feed will prove that there’s nothing cuter than a bouncing baby goat—except possibly a goat doing yoga. 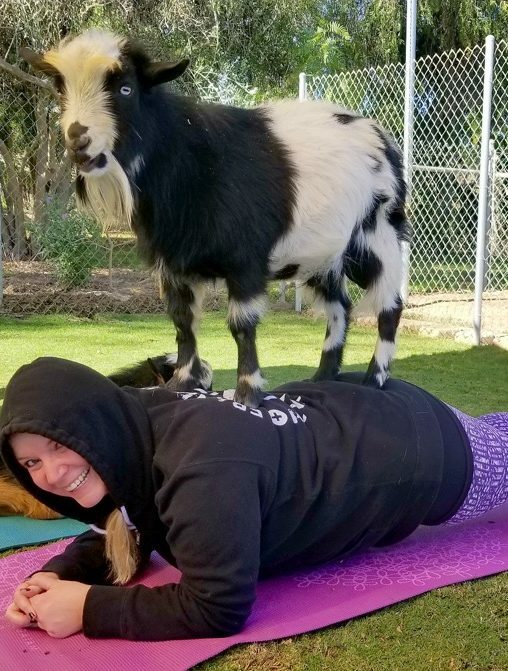 At the Blissful Goat in rural San Marcos, you’ll experience just that—or, rather, a goat standing on your back as you do your best to stay in plank position. Why goat yoga, you ask? “In the same way goats are housed with horses for their stabilizing and calming influence, being in a goat’s presence puts me into an anxiety-free, ‘blissful’ state of being,” says Star Bailey, a licensed chiropractor and instructor of Goat Yoga Light, an introductory class for yogis of all levels. Held on her farm in rural San Marcos, the class is as much about laughing and adorable photo ops as it is about stretching, breathing and posing. If farm animals aren’t your thing, there are plenty of ways to exercise with another four-legged workout partner. Celapino has traveled the country with her favorite workout buddy—her senior Cairn terrier, Jack—teaching fitness classes along the way. In San Diego, she offers a wide variety of group workouts—from hiking to “K9 Core & Conditioning” to yoga. No pet? No problem! At The Cat Café, in downtown’s Marina District, you can adopt one—or simply spend some time socializing with adoptable felines from The Rescue House. The coffeehouse-meets-cat-rescue offers the opportunity to interact with animals seeking loving homes—all while enjoying an energizing cup of espresso or a relaxing savasana. At “Cats on Mats,” you’ll combine your love of cats, coffee and calming yoga.